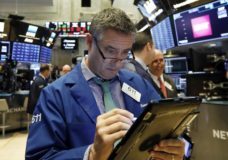 Stocks closed modestly higher Monday after shedding most of the gains from an early rally spurred by the Trump administration’s decision to hold off on increasing tariffs on imported Chinese goods. NEW YORK — U.S. stocks dipped in early trading Friday to join a worldwide drift lower as concerns remain high about global trade and the strength of the economy. NEW YORK — Stocks rose in early trading on Wall Street Tuesday following strong earnings reports from a range of U.S. companies, led by luxury retailers and technology companies.